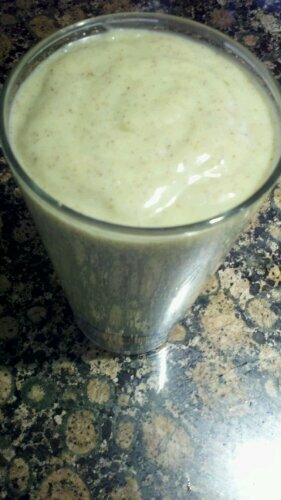 Kiwi Aloe Lime Coconut Smoothie & Spinach Orange Hemp Pesto. 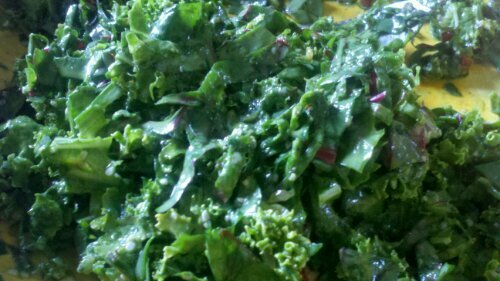 Tips On How To Keep Your Fridge More Juice, Smoothie & Homemade Dressing Friendly. Well I am getting close to my big grocery shopping day, Sunday when I buy my goodies at the Farmer’s Market. Sometimes by Thursday or so I have really random or odd things left in the house. These are the times where I can really work some magic and make something that I would have never thought of, or I can tell myself there is nothing I can make out of this. But as you can see something magical is thrown together and typically I am surprised at how well the flavors end up working together. Today I made a Kiwi Aloe Lime Coconut Smoothie that can also be consumed as a pudding, just let it sit in the fridge for about 15 minutes! 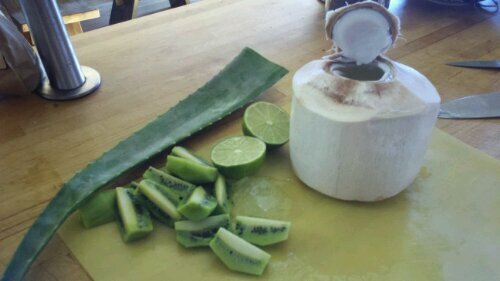 Add the coconut water first, kiwi and then everything else. It’s easier for the blender to mix with the high water content ingredients already around the blade. Blend until smooth & enjoy <3! If you have not worked with coconuts much and are a little nervous about how to actually scoop the meat out there are a few tips I have. 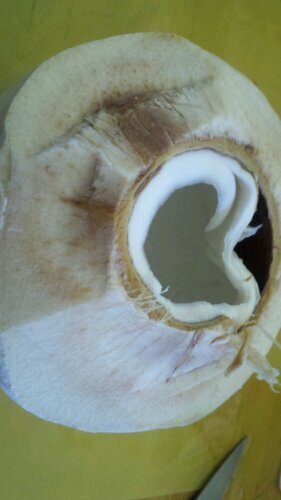 Make sure you give yourself a large enough hole to fit a rubber spatula inside the coconut. 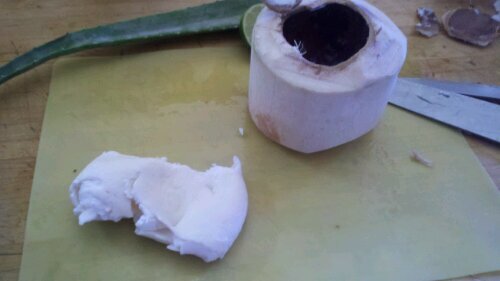 Between the shell and the meat slip your spatula through, pressing against the side of the coconut. Turn the coconut while you continue this motion. Aloe is commonly used for burns, scrapes, and seems to be increasingly common in “sports drinks.” When you cut a pieces of aloe you will notice that a slime milk like glue begins to form. This helps me remember how aloe is amazing to hydrate and accelerate skin repair. It also accelerates recovery time from an injury. Aloe has an amazing electrolyte balance, so I can completely understand why this is naturally an amazing “sports drink.” Some other benefits of aloe are that it; stabilizes blood sugar, reduces triglycerides in diabetics, prevents and treats candida, protects the kidneys, cures IBS and Chron’s, great for cleaning the blood (e.g, “sticky blood”) and ends constipation. Overall, it is a powerful anti-bacterial and anti-fungal plant. These are just a few of the endless health benefits of using aloe! This Kiwi Aloe Lime Coconut Smoothie has loads of electrolytes and repairing qualities also from the use of coconut 🙂 To learn more about coconuts, please feel free to read my previous post all about them 😀 I hope you all enjoy this drink as much as I do! Aloe at times can be a bit bitter, but with some citrus and sweet vanilla all or any bitterness is masked. Another recipe that I kind of threw together that surprised me was a Spinach Orange Hemp Pesto I came up with. This is a nut free recipe too! Yet again I didn’t keep track of how much of everything I used :-X eeek sorry! I used about one handful of spinach, a handful of basil and cut them chiffonade style. I used about 2 tablespoons of hemp seeds and about the same amount of olive oil. I am a huge garlic fan, so I used two garlic cloves! I also used about 4 fresh parsley sprigs chopped and one whole orange juice. Just for a little kick I added a few pinches of cumin and salt. I massaged this over a bowl of chiffonade cut chard & kale. I really wish I had some tomatoes, carrots, cucumbers, peppers or anything else to add some crunch and color but I didn’t have any around. I didn’t realize how tasty this would actually turn out! I am hoping that I can replicate this sometime, it’s a very simple idea so I know it is completely “do-able”! If you are finding it difficult to cram in time to make juices, smoothies and homemade dressings wash your vegetables a few days before juicing and keep them in a green bag. Make any dressings or salad toppers over the weekend also so healthy options are already at hand. If the Kiwi Lime Aloe Smoothie sounds too time consuming it is perfectly fine to scoop your coconut meat out ahead of time and may be even cut and freeze your fruit of choice! Leave yourself a sticky note on the fridge with what you have already done, recipes to follow, and what needs to be prepared within the next few days to keep this flow of healthy choices going. « Flexibility With Recipes. Why Every Recipe May Need Tweaking. Hey, you totally inspired me. 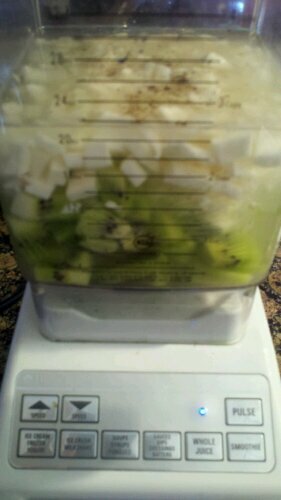 I have kiwi, aloe and coconut right here in my kitchen and I’m off to the blender!